The Confidential has devoted a lot of time and space to the Syracuse Orange. Once 25-0 and ranked #1, this made sense. But today’s matchup between the Virginia Cavaliers and Syracuse left no doubt which team deserves the regular season crown. It’s Virginia… who rolled over Syracuse, 75-56, on the way to a 16-1 regular season and championship. Clemson Men’s Basketball starts the week after an ugly loss to UNC last night, improving their record to 57-0. That record of course being the Tarheels have won 57 times against the Tigers while in the Dean Dome, the Tigers never seeing a victory. UNC is off to a slow start in ACC play but now improves to 12-7 overall and 2-4 in the ACC. Clemson started off hot, being 4-1 in the conference just last week, now drops to 13-6, 4-3 after two consecutive losses to Pitt and Carolina. The Tigers have a tough conference schedule coming up, facing FSU, Syracuse, and Notre Dame on the road. To note any highlights from last night’s game from a Clemson standpoint, would be a disservice to our readers. The Tigers played flat on defense and hesitant on offense. 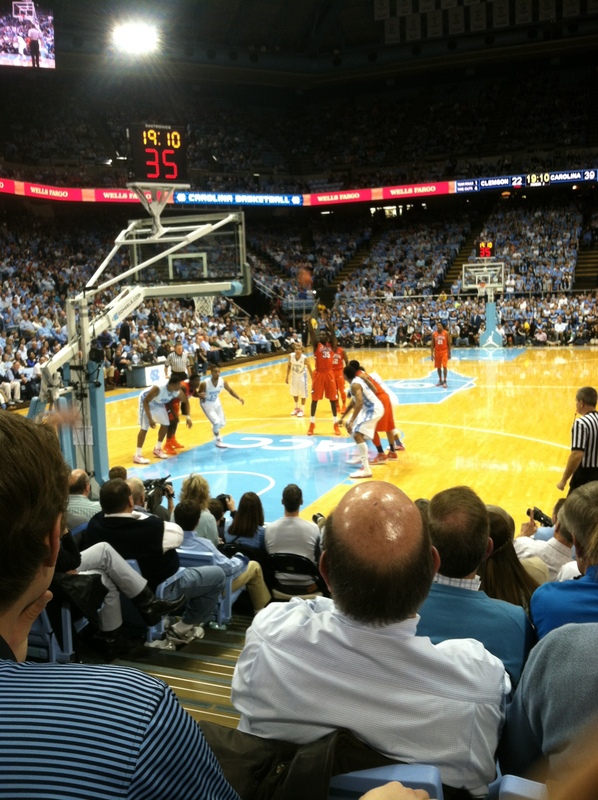 Seeing it first hand in the Dean Dome was taxing. Stops on defense were rare and the Tigers shot 34% from the field. That’s 18 field goals made out of 53 attempts. It was not a great night for the Tiger offense, to say the least. 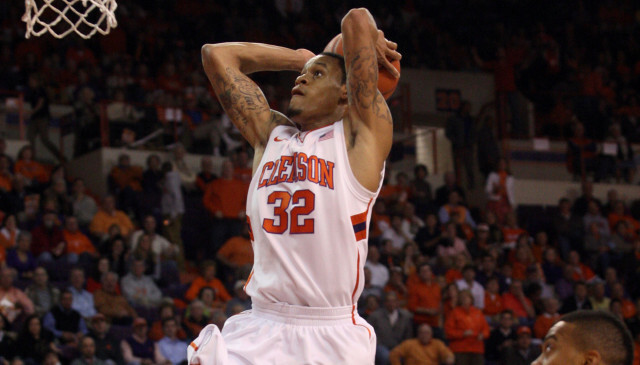 Leading scorer, KJ McDaniels, came up with 13 points, 9 rebounds, 2 assists, 2 steals, and 2 blocks. He was the game leader across the board for the Tigers. McDaniels has proven to be an offensive leader this season, but he can’t do it on his own. Adonis Filer came up with 12 points of his own, as did Landry Nnoko. Nnoko is improving but between him and Sidy Djitte at center, too many passes slipped through their hands down low in the paint for would be easy points. To end on a high note, the Tigers finished the night 19-25 at the line, giving them a 76% free throw percentage for the night. This Clemson team is young, consisting of four freshman, four sophomores, and five juniors to make up the Tiger squad. Playing on the road, especially in Chapel Hill, is tough and the Tigers have their work cut out for them in the coming weeks. In other Clemson news, a non-basketball related highlight of the evening was having Clemson football coach, Dabo Swinney, in the Dean Dome last night. Sitting a few rows behind the Clemson bench, the dynamite coach just signed a new 8-year contract with Clemson, keeping him a Tiger through the 2021 season. At halftime, Clemson fans throughout the dome stopped by to take pictures with the Orange Bowl Champion, including yours truly. It’s a check off my bucket list and as much as it pains me to say, I guess I have Chapel Hill to thank for that. Clemson takes on Florida State this Saturday in Tallahassee. Catch the ACC matchup at 3pm on ESPN2. 1. Winning the 2014 BCS Orange Bowl—Awwwww yeah! It literally came down to the last minute when Ohio State was down 40-35 with the ball at the 50 yard line. Braxton Miller threw a beautiful interception, caught by Clemson’s own Stephone Anthony. This sealed the deal for the Tigers and bonus points: Urban Meyer didn’t react by punching Anthony in the throat. 2. Tajh Boyd—In his final game as a Clemson Tiger, Tajh went out with a bang. As Dabo Swinney said, “He put an exclamation point on his legacy.” Tajh finished the game with five touchdowns and 505 all-purpose yards, 78 more yards than the Ohio State Buckeyes. We’re really going to miss his leadership and I can’t wait to see him play on Sunday’s. 4. Sammy Watkins—Saving the best for last. Sammy set an Orange Bowl record with 16 receptions and a Clemson and Orange Bowl record with 227 receiving yards. He was unbelievable. With an average of 14.2 yards per catch, he was Tajh Boyd’s go to receiver and his talent is going to be greatly missed. As a true junior, Sammy has declared for the NFL Draft. While we’ll miss his lightning speed and magnetic hands, he’ll represent Clemson well in the NFL next season. The Clemson Defense—While the score might reflect a shootout, it was truly entertaining watching the Tigers contain Ohio State QB, Braxton Miller, to a mere 35 yards rushing. They completely shut him down on the ground. With 18 carries, he rushed an average 1.9 yards per carry, his lowest of the season. Santa Claus—if you read my last article, the only thing on my Christmas list was a Clemson win. Ole’ Saint Nick pulled through. Thanks big guy. The Referee’s—One song comes to mind when trying to describe the officiating from Friday night, “these boys can’t hold us back, these boys can’t hold us back, we too deep (ay, ay)”. The anthem of a generation Clemson Football. Good try ref’s, you’ll need some more flags to stop this excessive celebration. *Let the record show I have a much deeper opinion on this matter but for lack of reader attention span will not disclose it here. This past weekend featured two huge match ups for Louisville which culminated into one epic Saturday. First up was the hardwood rivalry game with Kentucky in corRUPPt arena. N Carolina and Duke is the greatest basketball conference rivalry but Kentucky and Louisville is the greatest non conference hoops rivalry. Playing your rival ONCE a year adds a little extra to the game, in my opinion. From the time they tipped off shortly after 4pm until the buzzer sounded around 6:30 it was a dog fight. Ultimately it was the Cards coming out on the losing end of the 66-73 final score.